It was about time I had looked for a carrier for the full size spare. I was tired of carrying it around on the roof for two reasons. First, the weight and hassle of getting it up there. And second, the wind resistance... my gas mileage is noticeably lower with it on the roof. 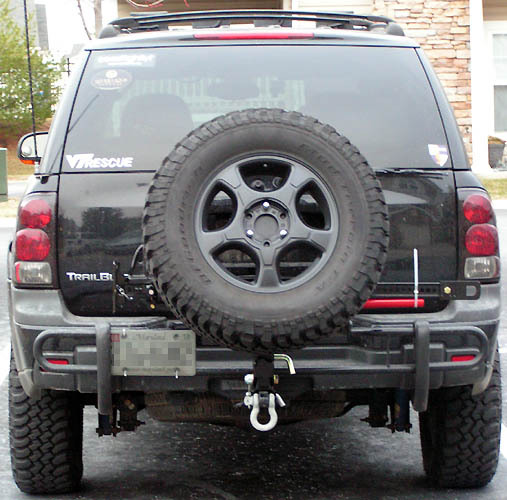 The hitch gate was one option, but while excellent, I feel its a bit bulky and expensive. 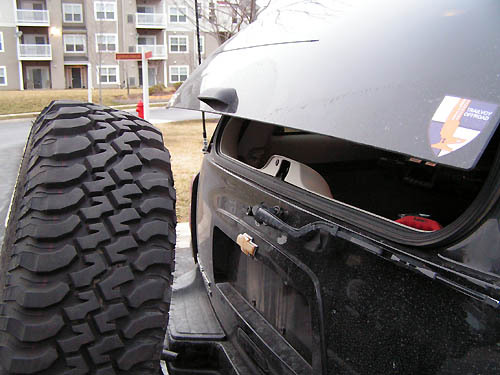 If I was getting a custom bumper made, I would have gone the swing-out route. But I liked Alek G's custom job, as it was lightweight and simple. I've been working with Steve at CBI Offroad for the past 4 months trying to work on a design that worked for the Trailblazer. He generally specializes in Toyotas, but was happy to work with me. I send him my desired dimensions, and key specifications, and he began working. Note the pass thru receiver. Steve reinforced the central tube of the carrier to withstand recovery forces. 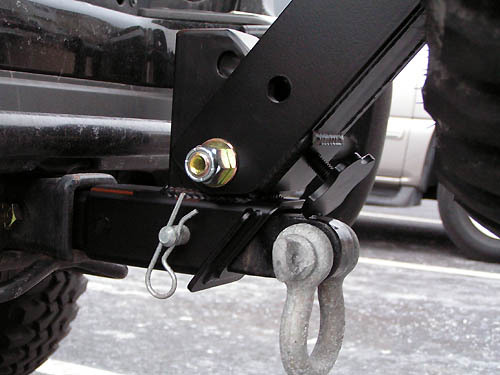 Instead of a hitch pin, the male end of the carrier is threaded. The bolts on either side are grade 8, and they take out all wiggle from that joint. Further back, you see the receiver tube. This is even cut at a angle to preserve the rear approach angle and act as a skid if necessary. Further up, you can see the tilt mechanism. This has a hand knob that allows you to tighten the carrier, and again get rid of rattles. 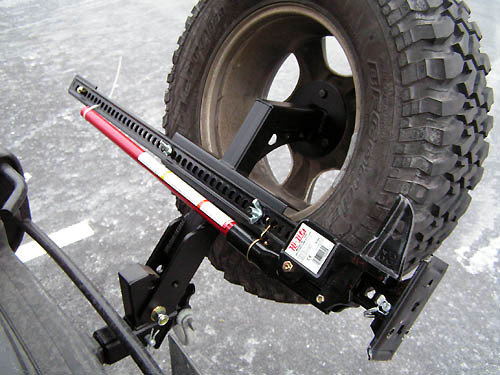 Use with the tire leaned back and the gate up. It's a bit of a tight squeeze to get into the trunk, but it's certainly workable. The view from the mirror. There's still lots of viewing room out the rear window. Ah yes, the license plate. This is a temporary solution for now. I plan on fabricating a bracket that throws the plate off to the side and relocates a light. But that's a project for another day. Steve was great to deal with, as he understood my concerns and specifications, and delivered with a great product. I only have two gripes. One, is that I wish the carrier dropped down a bit more. Currently my shackle bracket interferes with the tightening knob. 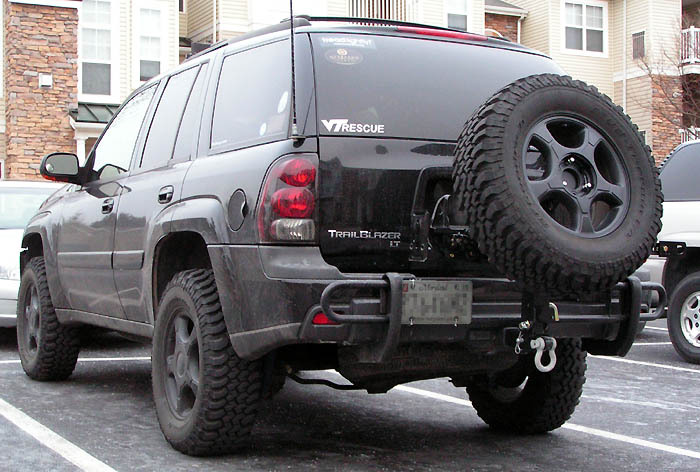 So, it can be lowered further if I take out the shackle bracket. Still, it cannot be lowered to a level point, which could be useful. The second gripe was shipping length. It was shipped by freight through Fastenal. I guess because I was anticipating the shipment, it seemed to take forever (two weeks). Hopefully it was just a fluke. Overall I'm very pleased. If anyone is interested, Steve takes orders by e-mail (found on his website http://cbioffroadfab.com/) and then he makes them custom to your specifications. Plus, its a great value. I paid $320 with shipping included. Thanks again Steve for a great product and great customer service! thats really nice man. props!! Gets me thinking to order one, have it shipped to my Niagara Falls address, pick it up on my way down to TECORE, and not pay any taxes on it! 1. 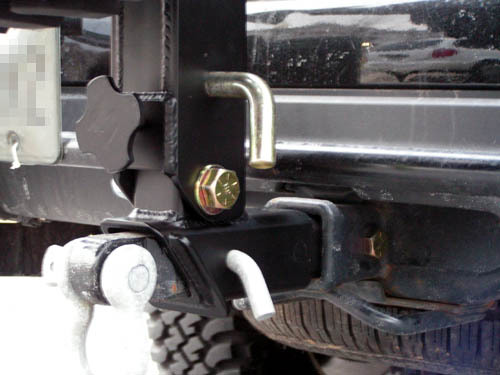 To clarify, in the down picture, it is being restricted by the recovery shackle mount correct? 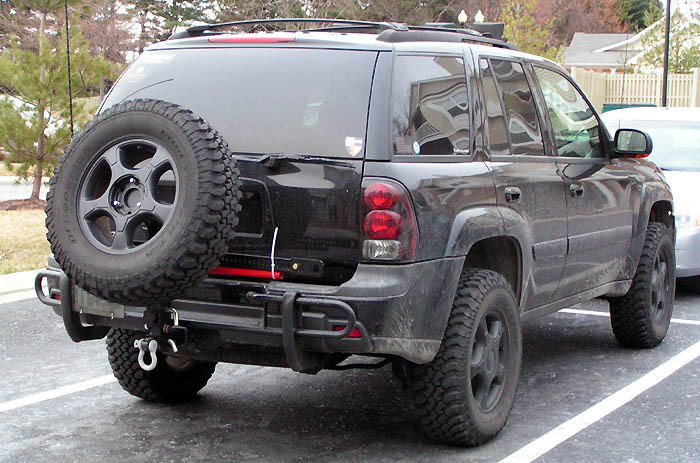 How much further would it lower with the shackle mount removed? (Mine doesn't extend to horizontal either). 2. I assume the upper glass can open (no picture). Is there enough room for 33s? 3. Is the wheel mount universal or do you need to specify the bolt pattern? 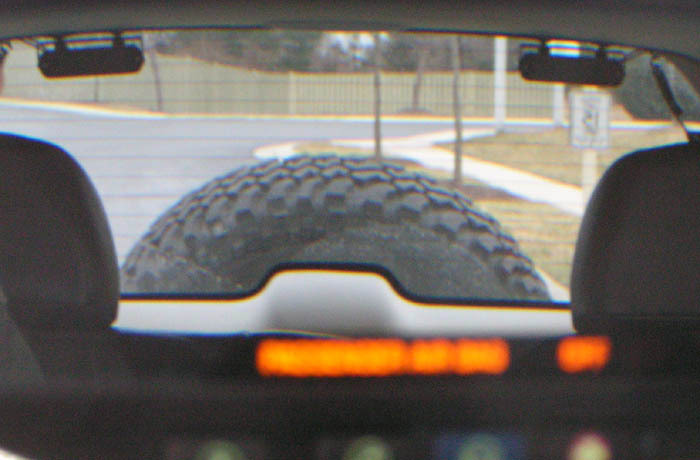 And what is your wheel offset/backspace, I couldn't find it in your profile. I'm thinking how would he work with different offsets in terms of making sure the tire is not too far or close to the vertical bar? 4. How is the HiLift mounted? Any chance of a close up of that? 5. Including shipping, what do you think a full fab+delivery time would be? You're in luck. I took a bunch of pictures today! That's a picture of the interference. I just checked it without the shackle bracket, and it goes down a little past 50 degrees (or so). Yep, theres at least 3 inches of clearance. Plenty for 33"ers. The studs are set for the pattern I specified (stock). You can specify whatever pattern you'd like. Made to order! You're in luck... wingnuts! The bolt on the driver side is mobile, but captured so it does not fall out. That would be something Steve would have to tell you. From what I know, he has a schedule of when he makes the spare holders. It took an extra week to powder, then three weeks for shipping. All in all, it took a bit over a month from when he started. But from what I understand, he just rolled out this new version of the carrier, which may have delayed it more. You'll have to talk to him though... not sure really. Wonderful! I wish for more rear visibility all the time. I had the HitchGate off for a few months after the Sierra trip, and just put it back on last week. Big blind spot back there now. That height for the tire is great. Any mods possible for gas can carriage? 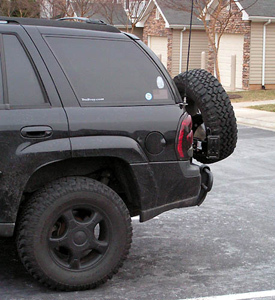 Oh, you might think about locking hitch pins. Only1Balto had a shackle swiped from his apartment parking lot one night when he only had a removable pin like that. I've toyed with the idea of a gas carrier, but after talking with Steve, I'm going to go a different route with that. More on that later this month... hopefully. Now that I saw the interference issue, I think I may store the shackle in my drawer until I'm in a situation that may need it. The extra drop could be handy when loading groceries... I mean... rocks! I would be very surprised if someone could make these for less than Steve because Steve produces these a few at a time. 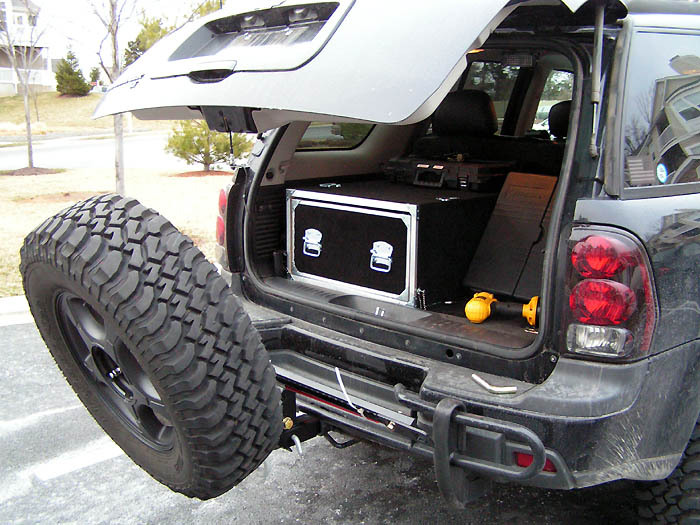 I talked to a local fab guy about one-offing a hitch carrier, and he quoted me much higher... but that's because it would have been his first (and prob only) he'd make (added cost for R&D). Now, THAT is a tasty burger!